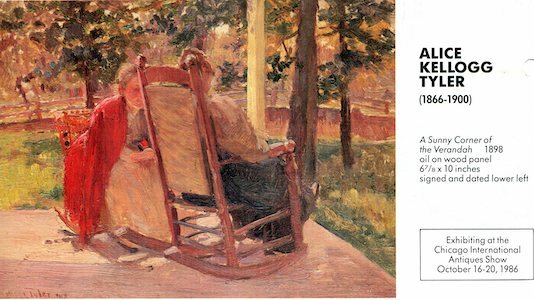 Alice DeWolf Kellogg Tyler, 1862-1900, was a well known artist in Chicago and highly regarded art instructor at the Chicago Academy of Fine Arts (Art Institute of Chicago). 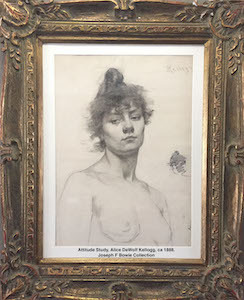 1888 she was in Paris and took formal instruction at the Academie Julian and the Academie Colarossi and exhibited paintings at 1889 Exposition Universalle in Paris, and Chicago's 1893 World's fair. 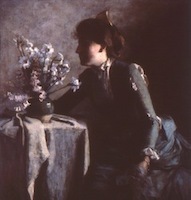 By 1890 she was teaching and exhibiting in Chicago at Jane Adam's Hull-House. 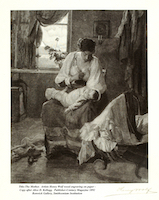 In 1891, she was first woman honored with membership in Society of American Artist. 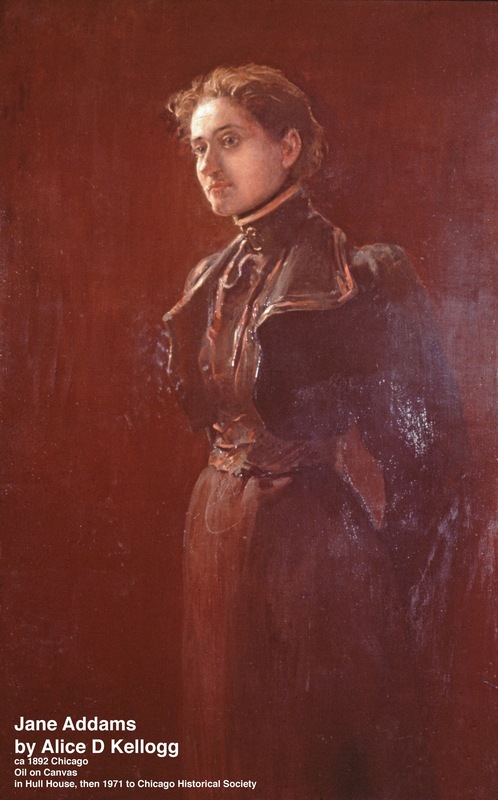 She was elected president of Chicago's Pallete Club in 1891, '92, and '95. When she died at age 37 of a complication of diabetes, many of her studies, works, letters, photos, and personal effects were locked into storage where they remained for 80 years. Alice's nephew, John Rich with his second wife Phyliss, moved to Eureka Springs, Arkansas with that large collection about 1950. John died 1974, Phyliss in May 1981. 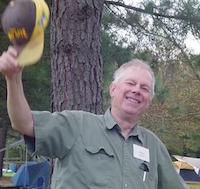 Memory of Alice Kellogg Tyler may have never awaken had not her great-grand niece, JoAnne W. Bowie, 1951-2016, become involved in the settlement of the estate Phyliss Rich. JoAnne, a granddaughter of John Rich and his first wife, was the only relative in living Arkansas. She was contacted by an aunt, Sally F. Rich, daughter of John and Phyliss, who wanted JoAnne to have a piece of heirloom furniture and other keepsakes from her grandfather's home. 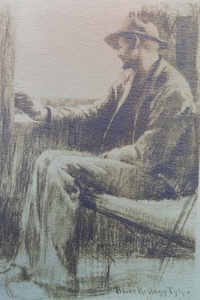 On our first visit to the house in Eureka Springs (abt Aug 1981), we found a large room that was cluttered with boxes of old letters, photographs, drawings, charcoals, paintings ( framed, loose, rolled, and folded ). As we browsed the piles of these things, JoAnne commented several times "who did this" and "this is really good". 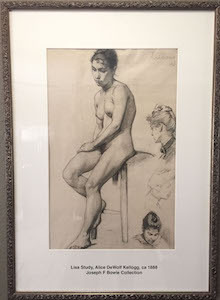 over the next few weeks?/months?, she found that even though Kellogg had been a notable, highly respected artist, information about her was scarce and difficult to find. On the other hand, the letters, diaries, and sketch books had details with names, dates, and events that greatly expanded on the available history of that period and of women artist in particular. Soon JoAnne was saying "I am going to reintroduce Alice Kellogg to the world". By the time JoAnne died in January 2016, it was clear that she had succeeded in reviving the memory of Alice Kellogg Tyler and her art as evidenced by exhibits, print publications, and online biographys and images (such as pinterest and wikipedia ). 1893, Board room of the Women’s Building in Chicago at World's Columbian Exposition. 1989-1990, Pennsvlania Academy of Fine Arts tour, Norfolk VA, Philadelphia PA, and Memphis TN. 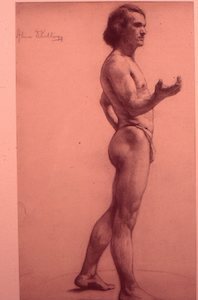 Attitude portrait study, c1887-89, charcoal on paper , about 21 x 15 inches. 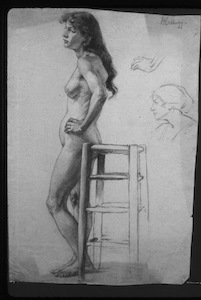 Lisa , figure study c 1887-89 charcoal on paper, abt 24x14 inches. A Sunny Corner of the Verandah, 1889, oil on wood panel, 7 x 10 inches, signed and date lower left. Out of Work, drawing, published in "Twenty Years at Hull House", Jane Addams, 1911, page 220. Portrait of Jane Addams, 1860-1935 A progressive social reformer and activist in Chicago, winner of Nobel Peace Prize 1931. Williams & McCormick catalogs offering ADK works for sale, with biographical essays, 1986 and 1987. 15 MB file. 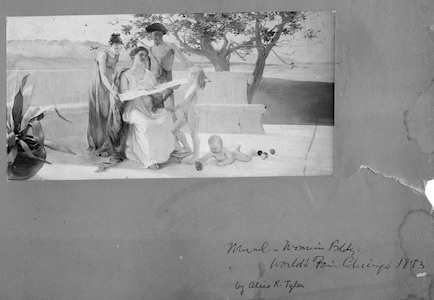 Biographic resources for Alice Kellogg Tyler, 1862-1900. Tribute by Lorado Taft, one year later. "The Excellent Becomes Permanent", eulogy by Jane Addams, later published in book, chapter V, pages 51-58. Biography of Kellogg Tyler, Alice DeWolf, 1862-1900 by JoAnne Wiemers Bowie , pages 458 to 470 of the book Women Building Chicago 1790-1990, A Biographical Dictionary; Indiana University Press, Bloomington,IN, 2001, Editors: Schultz & Hast. ISBN 0-253-33852-2. Title:The Mother. copy in Renwick Gallery, Smithsonian Institution . Book of Bowie Front Page.